I saw this recipe on Savory Sweet Life and decided to give it a try. I'll give it a 4/5. It was pretty easy to whip up in the morning, and it smelled great, but next time I plan to replace the vegetable oil with melted butter because I feel this cake would be much improved with a buttery flavor. In case you didn't know, I love butter. The recipe is satisfactory as-is, but I believe the melted butter would take it over the top. The original recipe called for Granny Smith Apples. I love Granny Smiths, but I had a fridge drawer full of Cortland and Jonagold apples, so that's what I used. I'm sure the Grannys would have tasted better (I love their tart flavor), but I used what I had. I added a few extra spices to the batter (nutmeg and ginger) and at the last minute I decided to add chopped walnuts and almonds to the top. I bet it would have been even better if I created a crumble topping with nuts, butter, flour, and brown sugar for the topping. Next time. So, as you can see, this recipe makes a huge cake. I live in a household of two, so I ended up serving some of this as a dessert on Christmas (I baked it for brunch on Christmas Eve). Next time, I would halve this recipe and bake it in a smaller dish. Overall, it's much better than any coffee cake you could purchase at a convenience or grocery store and perhaps better than those sold at some coffee shops (although I'm still trying to figure out that sticky cinnamon swirl in the Reduced Fat Coffee Cake at Starbucks... yum!). Preheat oven at 350°F and grease a 9×13 baking dish. In a medium bowl, toss sliced apples, 1/3 cup of sugar, and cinnamon in a bowl and set aside. In a mixing bowl combine flour, 2 cups sugar, baking powder,vanilla, eggs, salt, oj, apple sauce, and vegetable oil until well mixed. Approx. 5 minutes in a mixer. 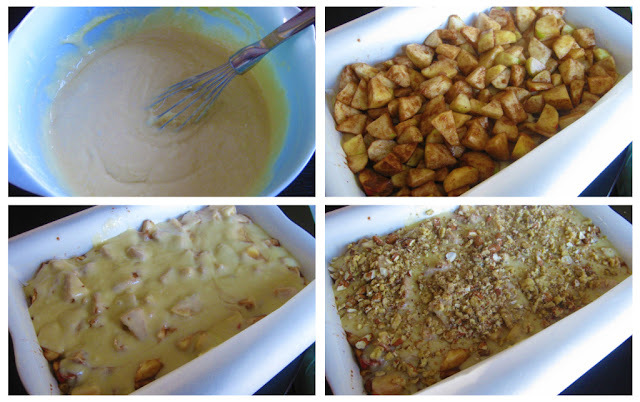 Pour half the batter into baking dish and arrange apple slices on top. Pour and spread the rest of the batter on top of the apples. I topped it with 1 c. toasted nuts. Bake for 60 minutes or until done. My cake took nearly 90 minutes. Cut coffee cake into squares and serve warm. Enjoy! I'm salivating. Love your pictures. I will be trying this cake. Thanks for sharing. In your headnotes, you say the next time you will use melted butter in place of the oil will it still be a 1/2 cup or would it be more.